A product that has gained surprising popularity in the last few years is the “remineralizing” postfilter cartridge for undersink reverse osmosis (RO) units. The process of reverse osmosis removes some 95% of water’s mineral content and, as a consequence, produces water that is temporarily low in pH. For many years, vendors of non-RO drinking water systems have raised the argument (driven more by marketing than by science) that RO water lacks “healthful minerals” the body needs. This ignores the fact that our bodies obtain minerals readily and easily from the organic minerals in foods and really don’t need the difficult to assimilate inorganic minerals found in water. More recently, sellers of “alkalizers,” or “ionizer” machines which produce alkaline drinking water, have added fuel to the argument by claiming the pH of RO water is too low to be healthful. To counter these arguments, RO vendors have created postfilter cartridges that add minerals while also raising the pH of low-mineral, slightly acidic reverse osmosis water. These cartridges are comprised mainly of two common water treatment minerals, Calcite and Corosex. Both have been used for decades in tank-style filters to raise the pH of acidic well water. Calcite is a pure form of crushed marble or limestone, refined into a granular medium suitable for use in a water filter. It works by dissolving slowly into the water, adding calcium and raising pH. Corosex is a brand name for manganese oxide, another natural mineral that dissolves to add magnesium and neutralize free carbon dioxide; thus, driving the pH down. Calcite is a milder pH treatment than Corosex, so the standard mix in most filters is at least 4/5 Calcite. 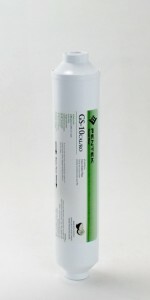 This simple inline cartridge manufactured by a leading filter company costs $16. It can be easily added to any standard RO unit. It contains Calcite to boost pH by adding calcium carbonate and improves the taste of the water with coconut shell carbon. It is inexpensive because it lacks any exotic ingredients. While Calcite and Corosex are clearly the workhorse media of all RO remineralizing filters, an in-house survey of a dozen websites turned up a lot of other ingredients. Some ingredients were commonplace and some pretty exotic. It also revealed a wide range of prices and some interesting product claims. Prices on the random sites we looked at go from $19.95 to $149 with the average around $65. Although it might be a stretch to say tourmaline has supernatural powers, it does have the uncommon and very special ability to generate an electric charge and emit negative ions and far infrared rays. Far infrared rays are invisible waves of energy. They’re able to penetrate all layers of the human body and reach the inner-most regions of tissues, muscles and bone. Through this, far infrared rays and negative ions gently soothe, stimulate and detoxify the body and mind. Negative ions are also incredibly important in determining mood.. . . Research has shown that mood disorders may be improved just as well through negative ion generators as antidepressants — but without the negative side effects. Why? Because these ions promote oxygenation to the brain and regeneration of the blood. [which is] . . . induced from the highly energized state of infinitesimal amount of ferric ferrous salts that have excellent antioxidant effect of protecting human bodies from active oxygen (free radicals) that causes various diseases and stresses (removing harmful active oxygen cause cancer, diabetic, hypertension, etc. ), neutralization actions from harmful toxins (controls oxidation reduction reaction; detoxification action) and prevent rotting (inhibition of microbial growth, such as virus and bacteria) in the intestines. In addition, they have calcium antagonism (Calcium antagonist properties), high vital activation energy (Life energy), small water molecule structure, contains abundance oxygen, equal pH to body (pH balance), boost immune system, and bio memory and ability to transfer biological information. . . . Finally there is “Edox,” which we could not identify. It is most likely a brand name for one or more of the other ingredients mentioned. Regardless of the exotics, the main ingredient of all remineralizing products is plain and simple Calcite. Calcite is mainly pure calcium carbonate, CaCO3. It is the principal constituent of limestone and marble. It may also have traces of other minerals such as manganese, magnesium, iron, boron, and bromine. (See Britannica.com). If you believe reverse osmosis water needs mineral supplementation to be “healthful” (we don’t! ), RO water filtered through a small bed of Calcite will meet the requirement. And, if you want a pH above the low 7’s, you can buy a Calcite cartridge that has a just pinch of Corosex added to it. Although water straight from the RO unit is wonderful, we like Calcite filters because they can make exceptionally good tasting water. With or without remineralizing, pure reverse osmosis water tastes great and is the best value drinking water that can be produced in the home.